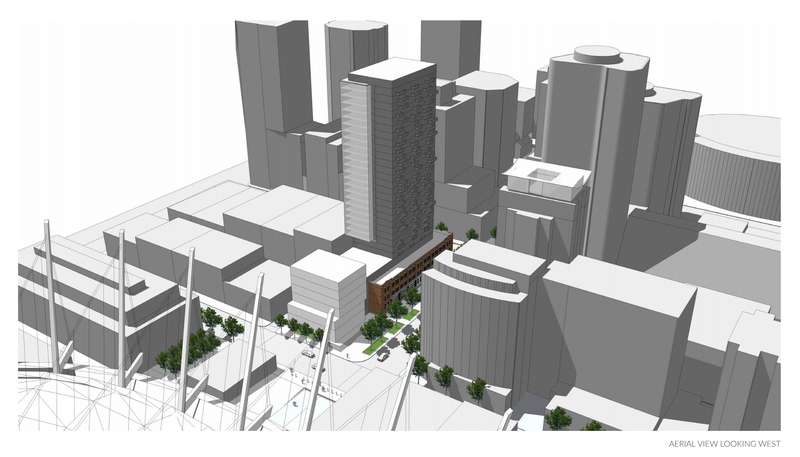 Canadian developer, Amacon, has proposed to redevelop the site of the Northern Electric Company Building at 118-150 Robson Street into a mixed-use building containing a 120-room hotel, 4,635 sq ft of commercial space, and a residential tower with 125 condominiums. The Art Moderne façade of the heritage building will be restored and re-purposed into retail shops and a hotel, above which a new luxury residential tower will be constructed. Located where Downtown Vancouver transitions into the residential neighbourhoods surrounding the north shore of False Creek, you’ll have within mere steps of your front door an exceptional range of eateries, shops, professional services, and leisure activities for unparalleled convenience. Revel in the nightlife of Granville Street or cheer on the home team at a BC Lions game in BC Place. Survey the brand name boutiques along Robson Street or enjoy a fine dining experience in one of Yaletown’s eclectic restaurants. Living more is driving less. As this project is in the development application stage, pricing has not yet been finalized. To ensure you are kept up-to-date on this excellent purchase opportunity, we strongly recommend signing up to our VIP list above. Current plans envision 125 residential suites, ranging from studios to 3-bedrooms, making this property suitable for families. Residents will enjoy shared use of a fifth floor indoor amenity room and an outdoor area to enjoy fine summer days with family and friends. Have out-of-town guests visiting? What’s more convenient than staying at the attached 120-room hotel and have use of its amenities? So many more conveniences are located just outside your door. Approximately 280 underground parking and 250 bicycle stalls have been proposed for residents, hotel guests, and retail customers. Of these, 56 will be electric vehicle charging stations. Will be included with release of pricing information. 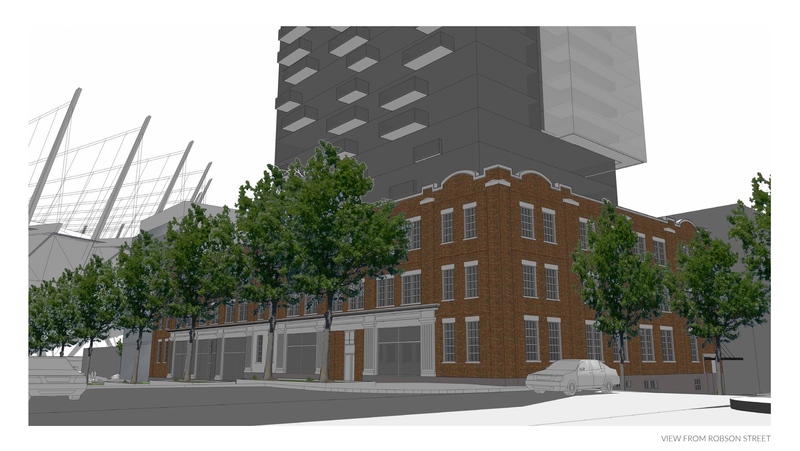 Amacon, developer of prestigious properties such as Modern on Burrard Street, has partnered with GBL Architects to redevelop the former Downtown Vancouver Catholic Archdiocese property. For over four decades, Amacon has been one of the most influential real estate development and construction firms in Canada. With a spectacular portfolio of landmark developments in Vancouver and Toronto, Amacon has established a highly-regarded reputation for setting the standard in the development industry. Amacon is driven by passion to design with architectural innovation; a commitment to constructing uncompromising standards of quality and superior craftsmanship; and offering responsive customer care and proven satisfaction. These are the building blocks that define Amacon’s signature developments and new communities. GBL Architects is a comprehensive, energetic, and diverse firm of architects providing a full range of architectural services to the private and public sectors. The firm has built its reputation on high quality design, tight project management, technical proficiency, financial responsibility, and keen administrative skills. Each project design is based upon our knowledge of traditional and innovative construction techniques, materials and methods, and our familiarity with the appropriate local codes and approval processes. The considerable number of projects successfully realized by GBL have helped to shape the form and development of communities and neighbourhoods throughout British Columbia. Are you interested in learning more about other homes in Yaletown, Southeast False Creek, or Chinatown?